By harnessing innovations in and widespread expansion of technology, PMA2020 promotes the use of accurate, timely, accessible information to facilitate annual progress reporting in 10 FP2020 countries across Africa and Asia. The project, led by the Bill & Melinda Gates Institute of Population and Reproduction at the Johns Hopkins Bloomberg School of Public Health, leverages a mobile Assisted Data and Dissemination System (mADDS) to produce new analyses automatically and rapidly to better inform family planning programs and policy. PMA2020 will deliver data from nationally representative household and facility surveys, in real-time using mobile phone technologies, fielded through a cadre of resident enumerators who are recruited, trained, and deployed on a regular basis to conduct successive survey rounds. In addition to replicating questions included in the Demographic and Health Survey (DHS) and Multiple Indicator Cluster Survey (MICS), PMA2020 introduces new questions that address access, equity, quality, and choice. These questions generate a broader set of family planning data, allowing for more in-depth monitoring and analysis across a subset of countries, and are critical to tracking whether rights are respected, protected, and fulfilled. At the time of preparing this report, data was being collected in Ghana and surveys were about to begin in Democratic Republic of Congo, Ethiopia, Kenya, and Uganda. Data collected from these surveys will feed into FP2020 core indicators and be presented in future FP2020 progress reports. 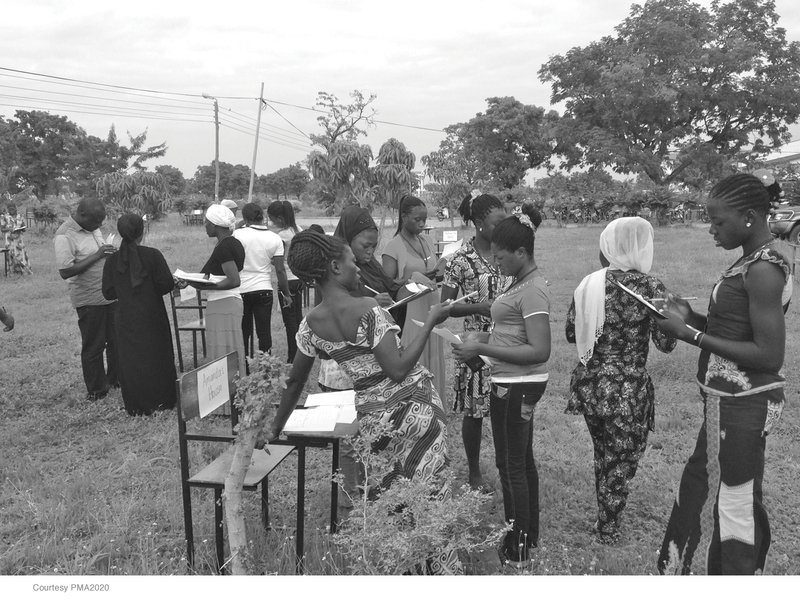 PMA2020 has trained more than 100 female resident enumerators in Ghana. Each was recruited from her community, where data are collected. Together, they comprise a sentinel network that is activated to conduct repeated rounds of the survey, interviewing approximately 40 households and three service delivery points each time. Each enumerator is equipped with a smartphone, supported by a regional supervisor, and compensated for her work. Through training, equipping, and supporting this network of sentinel resident enumerators, PMA2020 is building local skills for generating meaningful and timely data for program improvement. Enumerators commented on what they liked best about the training: “It gave us the opportunity to build self-confidence,” “The belief that we can do it,” and “The training has brought improvement to my life.”In addition, the project strengthens the capacity of local university partners to manage all aspects of survey implementation.